So, in my prom dress research, I learned that short prom dresses are in right now. I’ll confess, I don’t like short dresses. I am a maxi lenght girl, but I’m also pretty tall. I have been told by my height challenged friends that short dresses are nice when you’re not tall. Anyhow, the prom trend for short dresses seems like a nice option for people who don’t like long dresses. The paper doll dress on the right is a more sophisticated cocktail sort of option. Very modern with that obi-sash detail. 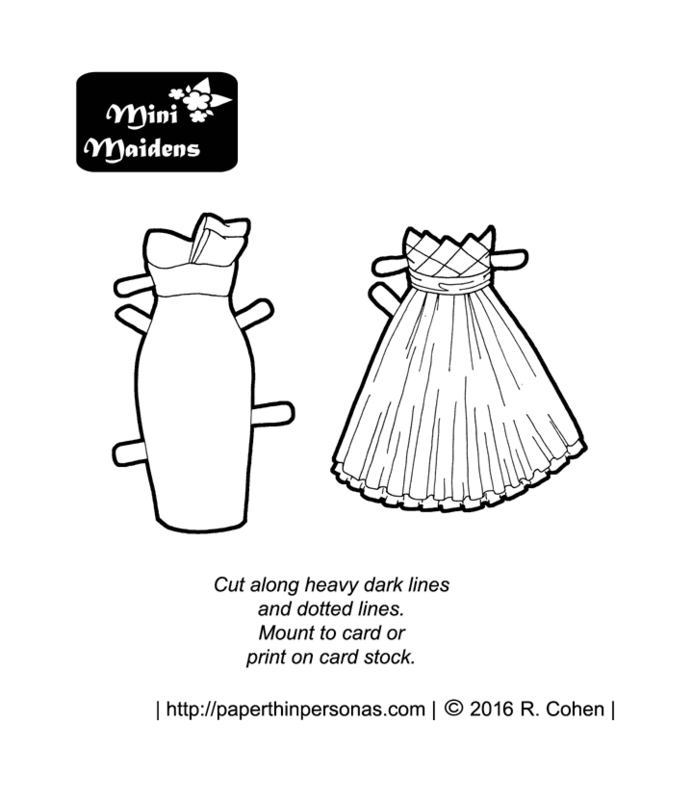 The paper doll dress on the left is actually a take on a dress I drew years ago for this Marisole Monday Prom Paper Doll set back in 2010. So, my question is, who was into short dresses for their prom? I wasn’t, but I suspect I have readers who went the short dress route. So, tell me in a comment. I’m quite curious. Also, if you want support the blog, I have a Patreon page. I’m 4’11”, but I loved long dresses. High enough heels underneath and I felt positively almost average height! LOL! I’m really loving the new format. I love looking forward to a new dress every day! I like long dresses too, but I’m 5’8″ so that may have something to do with it. But I think I’d still like them even if I were shorter. And ditto to loving the new format! It is so much fun to see what is new each day. Prom was a long time ago for me, and I’ve always been a long dress gal (even in my teens, I just didn’t have the legs for short dresses). I think the first short dress I saw for proms was ten years ago when my daughter was still in high school. It was cute, but dressy, so I see nothing wrong with it. The “little black dress” has been a thing for decades, so who’s to say you can’t have a “little whatever color you want dress”? Didn’t go to prom, but if I had it would have been in a long dress. I’m 5’3″ but have never been into short dresses. Too much Laura Ingalls as a child, I think: those Garth Williams pictures of her aunts in 1860s dresses, sigh. I still wear long skirts, no pants, by choice. Beware early book influences in children; you never know what will happen. That’s where having a mother who was a seamstress was handy! lol. She could alter anything and it was as good as any professional.